Primos brings you a holster for your calls. The Gobbler® Vest is by no means another vest with lots of pockets and a cushion to sit on. It's a custom designed call holster. Primos designed the Gobbler® Vest around all that we turkey hunters want with us in the field, our calls, gloves, mask, clippers, water bottle, shells, and a deep back pocket to carry out that gobbler! Primos brings you a holster for your calls. 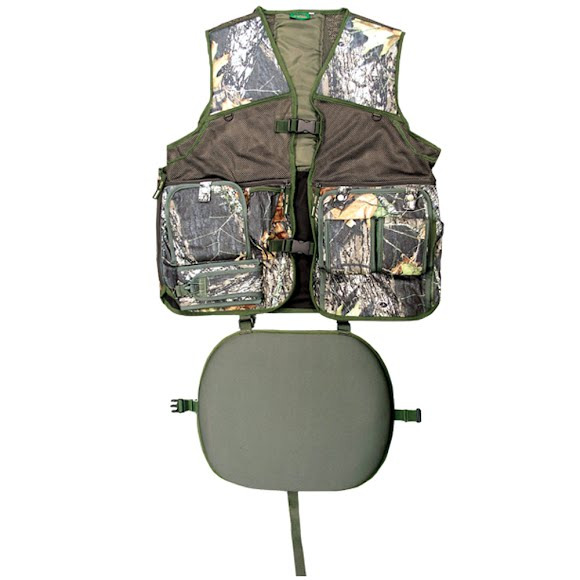 The Gobbler® Vest is by no means another vest with lots of pockets and a cushion to sit on. It&apos;s a custom designed call holster. Primos designed the Gobbler® Vest around all that we turkey hunters want with us in the field, our calls, gloves, mask, clippers, water bottle, shells, and a deep back pocket to carry out that gobbler! A molded waterproof foam that takes on the appearance of a tree&apos;s bark. TreeHide™ is waterproof and durable providing excellent protection for your gear. The TreeHide™ shoulder pads also reduce the felt recoil produced by heavy turkey loads.